No one who lives in DC is actually from here. “Home” is always a word for another state, another city, another place – even if that’s somewhere in the DMV area (so, I admit I don’t think Fairfax counts as DC). Somehow, almost 14 years have passed since I first moved here, and when I talk about going home, I always mean Boston. However, there are some signs that my son will mean “DC” when he talks about home. Like the fact that we just bought a house here. (Side note: Yea, so that happened, and it was terrifying.) And he owns more DC-onesies than can fit in his chest of drawers. And most importantly, the local ramen guy knows his parents, and always manages to squeeze them in ahead of the long line. Thanks, Tony. 1. Heat a large skillet over medium heat and add oil to pan. Season the pork with salt and pepper, and then add pork to the pan and sear on all sides. Place in the slow cooker. 2. Increase the heat of the skillet and add onions, cut side down. Cook until charred, and then transfer to slow cooker. Add the stock and about two tablespoons of soy sauce to the slow cooker. Shake some red pepper in there for heat. Remove the stems from the mushrooms and add those to the slow cooker. Cover and cook on low for 7 hours. 3. Remove pork from cooker and let rest while you thinly slice the mushroom caps. Strain the mushroom caps from the brother. Add 2 tablespoons soy sauce, mushroom caps, sesame oil, and ginger to slow cooker. Cook on high for 20 minutes. Add noodles and corn to slow cooker; cook 5 minutes. 4. As the noodles cook, poach an egg or two to serve. 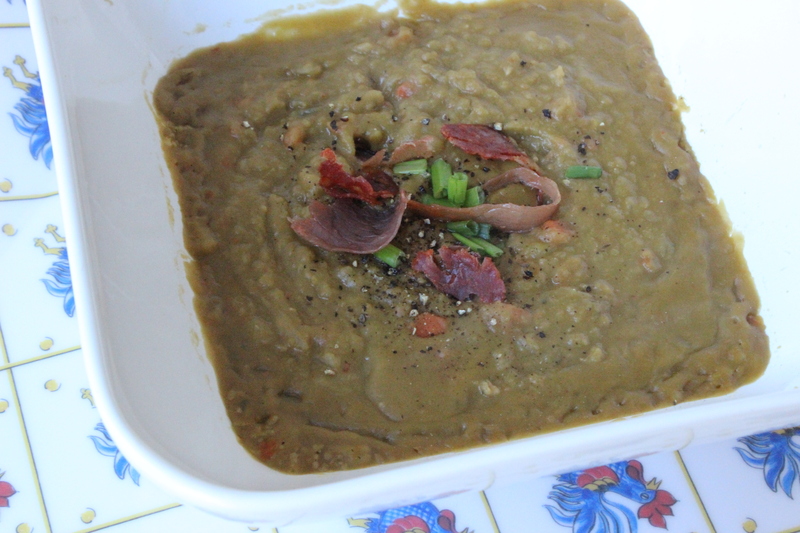 Serve with the soup, sprinkle with sesame seeds, scallions, and nori, if using. No one will be replacing Sakuramen anytime soon, but goodness this was good. We all know that chez nous, we have a strong, strong affinity for the slow cooker. One might even say it’s a deep, passionate love, if that weren’t a somewhat odd thing to say about something you plug into the wall. However, I do have a bone to pick with some slow cooker recipes. I’m looking at you, Williams Sonoma. As in: the whole POINT of the slow cooker is so you can fix it and forget it and still have a delicious meal at the end of the day. So while I love you, WS, think about this the next time you suggest an ingredient addition at the two hour mark, or a quick pass through the oven at the 90 minute mark, or removing the meat and adding some separately cooked vegetables about 3 hours in. Just, no. No one has time for that. If they did, they’d be actively cooking, and not plugging their dinner into the wall. Now that the rant section is over, let’s get on with the rave section. As in this pork recipe. Adapted from WS, this is a (really) good one, folks. And it’s a (mostly) fix-it-and-forget-it situation. Season the pork with salt and pepper and then sear each side in olive oil, over medium-high heat, in a large saute pan. (This is important for flavor.) Transfer to the slow cooker. About 30 minutes before the pork finishes, get your squash roasting. Preheat the oven to 425 degrees. On a large jelly roll pan, spread out the squash, drizzle olive oil, and then season with salt, pepper and crushed reds. Make sure it’s nice and tossed through, and then pop it in the oven for about 30 minutes, or until the squash is nice and roasted. While the squash and pork finish, make your vinaigrette. Combine all of the ingredients, whisk them together, and set aside. You could also add jalapeno or chilis, if you have them on hand. Reserve a bit of vinaigrette, as well as cilantro/basil for sprinkling on top of the pork/squash. Shred the pork in the slow cooker and spoon some of the liquid over it, to keep it moist. Add the vinaigrette to the squash separately, and give it a good toss. On a plate, make a bed out of the squash and serve the pork on top. Drizzle with a bit more vinaigrette and top with basil and/or cilantro. Hello, delicious! The vinaigrette and fresh herbs really make this one pop, so make sure you have that on hand and ready to go for this meal. (After, of course, you enjoy 6-7 hours away from your plugged-in dinner!). Let’s just say we won’t have high electricity bills stemming from time spent in the kitchen this month. I’ve had more important things to worry about…like, HOW in the world are we going to keep up with a bunch of 25 year olds this weekend? In the meantime, I did take a break from these important questions to whip this up last night. In a large, deep skillet, heat olive oil over medium heat. Add the onions, a bit of salt, pepper and crushed reds, and lower the temp; cook for about 8-10 minutes to get them nice and translucent. While the onions cook, boil water for the pasta and cook pasta according to the directions for al dente. Reserve a little bit of the starchy water for making a sauce. Add the tomatoes, mushrooms and sage to the onions. Cook down 3-4 minutes before adding the garlic. Add the apple cider vinegar and a bit off wine; cook of the alcohol. Add the sausage, crumble it in the pan, and cook all the way through. You may want to drain off a little bit of fat – if you do, you might consider adding more wine for a little bit of a sauce. Pasta water will also work well, if you want to add that. When the sausage is cooked through, add the pasta and give the mixture a toss. Add Parmesan and spinach and cover, letting the spinach wilt into the mixture a bit. Season to taste and serve, maybe top with a little more sage and Parmesan. 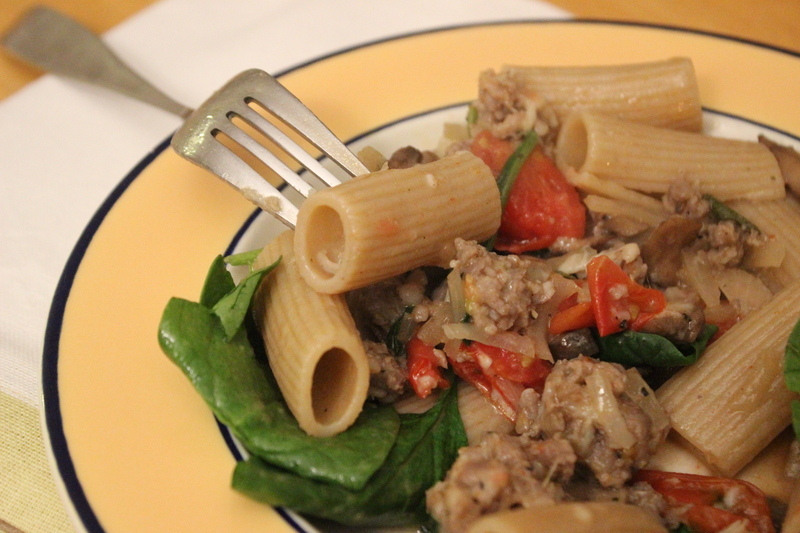 According to the Husband – someone who actually doesn’t like sausage – this was “awesome.” Make it from any combination of pasta, meat and veggies in your fridge for a little frost living action. And it made plenty for lunch…giving me more time to prep for our weekend in Cincinnati! I wore my pajamas inside out to bed last night. The Husband just gave me a strange look. Today we have our first glorious snow day of the season. For where we live, it’s real snow, too – enough to make a snow ball, enough to cover our car, and enough to shut down the city. The Hubs and I are just sitting on our computers, working, drinking tea, and contemplating when we’ll go for a walk through this wonderland. Life is good, and it requires soup. In a large saute pan, heat the olive oil and then cook the carrots, onion, and celery with a little bit of salt and pepper, about 5 minutes. Add about a tablespoon or two of white wine to dislodge any brown bits on the bottom of the pan. 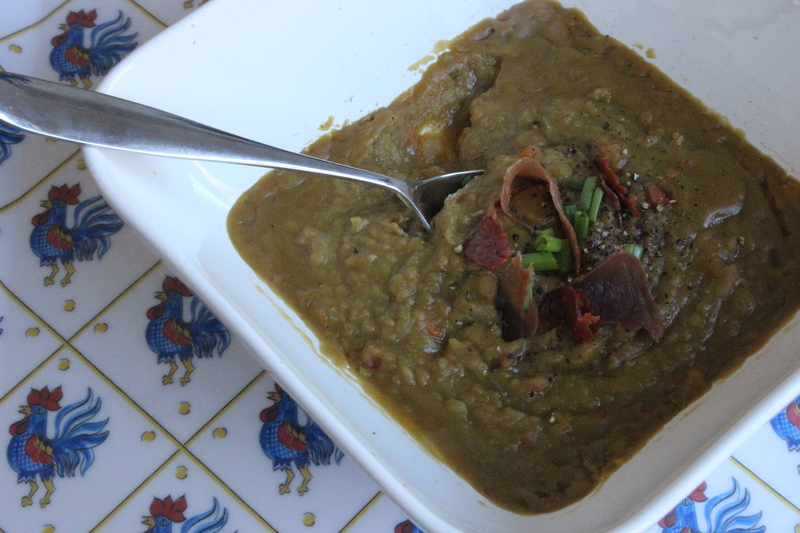 Transfer the veggies to a slow cooker and add the split peas, stock, 1 cup wine, 1 cup water, ham hock and thyme sprigs. Cover and cook on low about 9 hours. Remove the ham hock – and if you like, pull of the meat. Discard skin, bone, and cartilage. Remove the thyme sprigs. Season to taste with salt and pepper. Serve with a little bit of crumbled bacon/prosciutto/chorizo, if you’re going the decadent route. I’ve been wanting to try this recipe from Martha ever since my chef-alicious sister posted it during her guest blog. 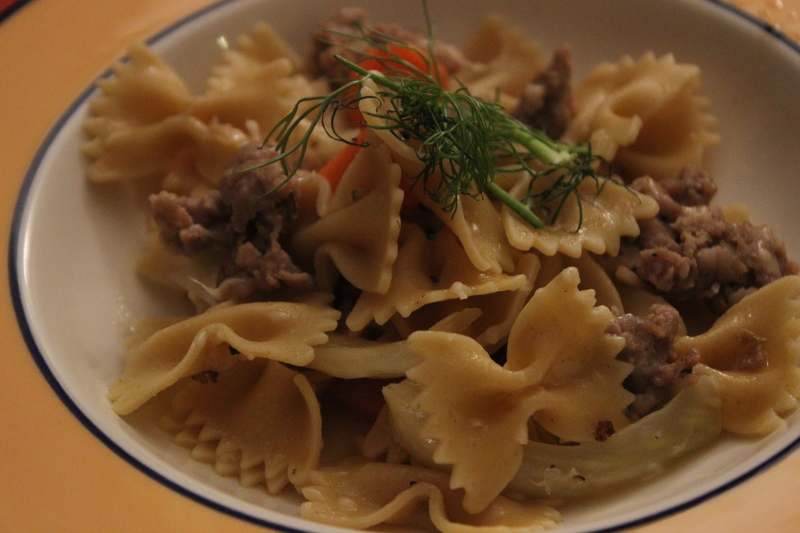 Sausage + fennel = one happy stomach. 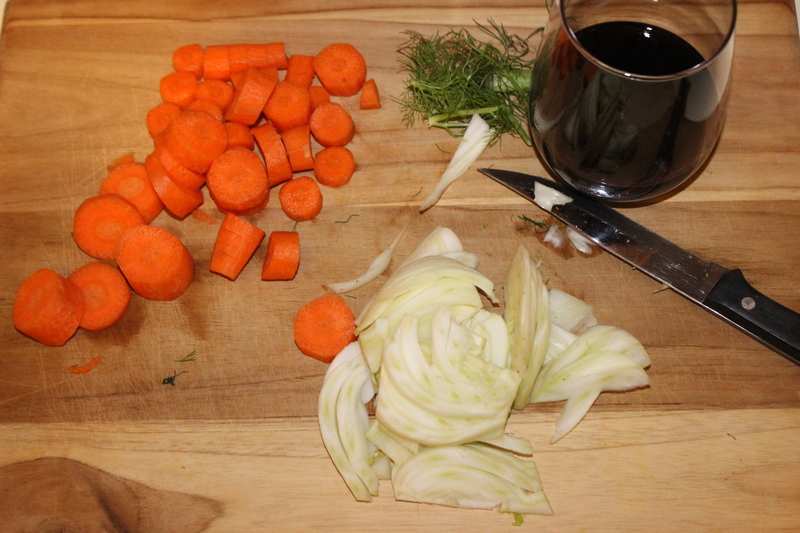 Use less pasta (maybe half a box, especially if you’re only serving for two people), more fennel (the full bulb) and more carrots (one or two more). The veggies get a bit lost in the pound of pasta. Add a clove or two of minced garlic while you’re browning the sausage, and season the mixture with black pepper. In fact, while you’re seasoning the sausage, a handful of crushed reds probably wouldn’t hurt (if you’re into that kind of thing). 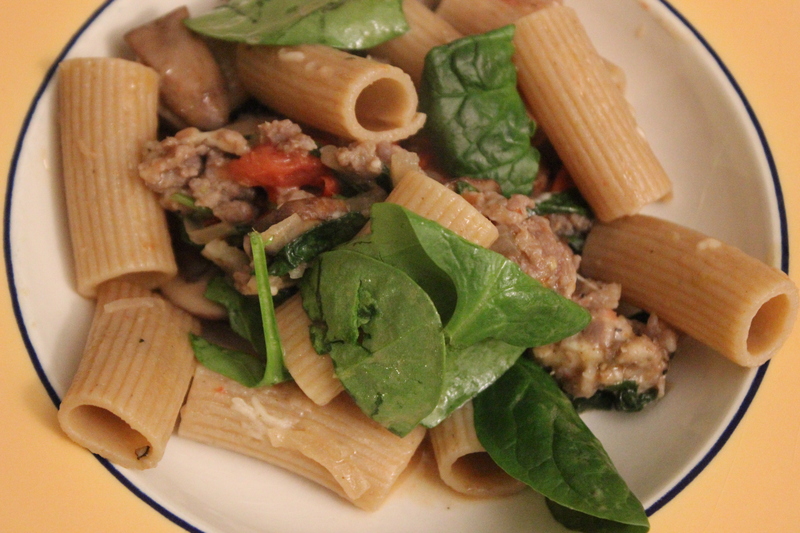 While the pasta cools, tossing it with arugula will up the healthy quotient and give it a nice peppery taste. With a few tweaks (sorry, Martha), this is really, really good. Well worth your while and your wine.